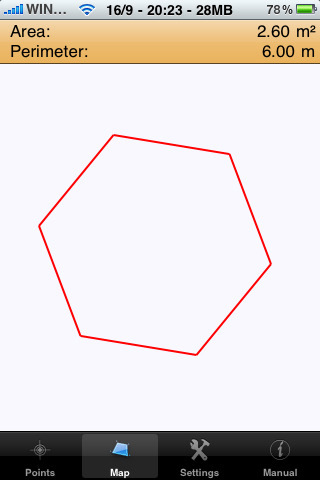 iTopography calculated the coordinates (x,y) of the six points and it drew the surface. At the top of the screen we read the area of the surface and the perimeter. These are the settings. 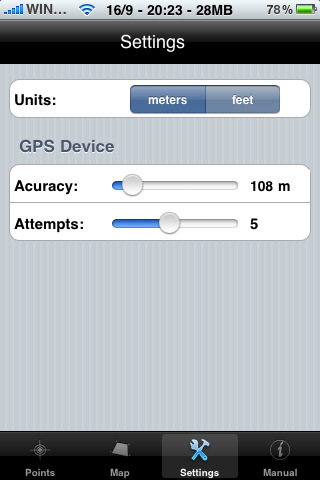 Currently, you can change the units, and control the accuracy of the GPS device. 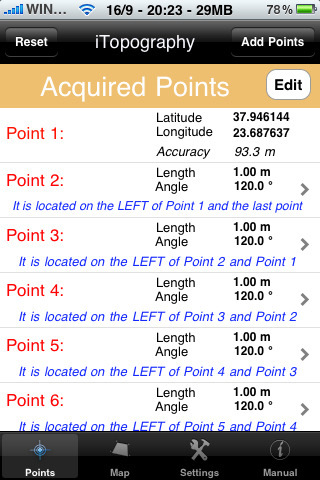 We provide two methods to control the accuracy: "Accuracy", iTopography will keep getting data from the GPS device until the accuracy for the location of the point is less than the value specified here. Because, this may take some time, iTopography will make only certain number of "Attempts" to obtain the given accuracy. Therefore, if after 5 attempts, iTopography was not able to get the location of the point with an accuracy less than 108m, a warning message will appear.